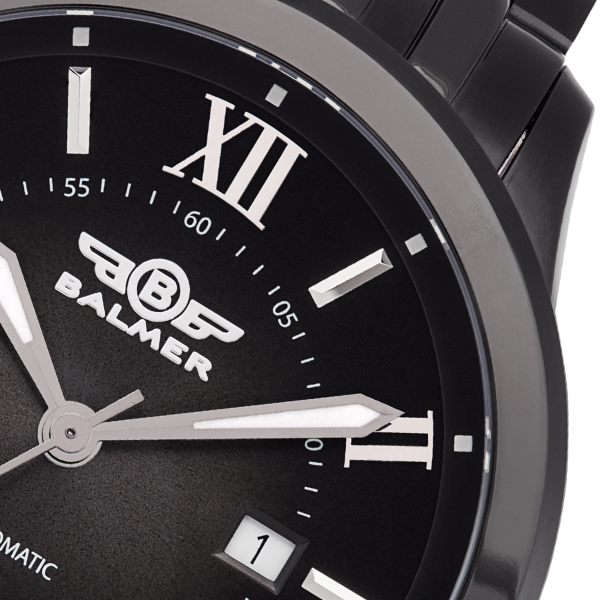 Swiss Automatic - Balmer Sets the Pace. 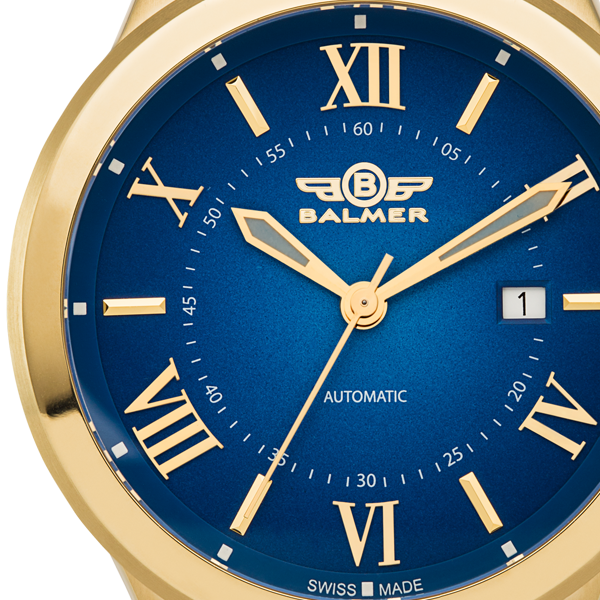 Utilizing highly skilled designers, engineers and technicians schooled in the rich tradition of Swiss watch making, Balmer produces timepieces not just for this generation but for generations to come as well. 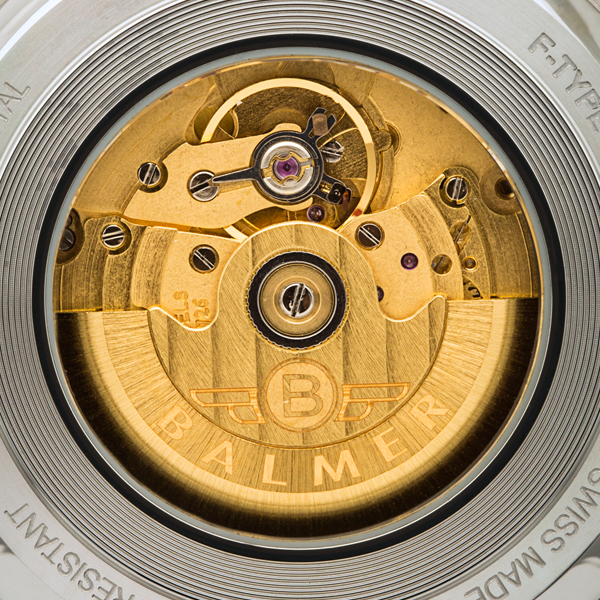 Using highest quality components including surgical-grade stainless steel, precision movements designed exclusively for Balmer and state-of-the art technologies, we craft watches in the heart of the famed Swiss watch making industry, creating timepieces not only to be worn with pride but to be handed down for the next generation. 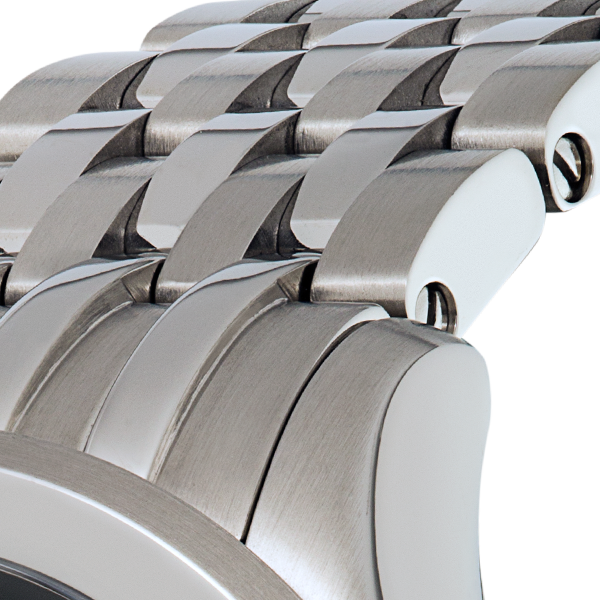 The distinctly masculine bracelet is crafted with seven links of surgical-grade stainless secured with link screws. Four of the links are in a rich, brushed satin finish, while the other three are meticulously hand polished in alternating links to create a distinctive bold look. 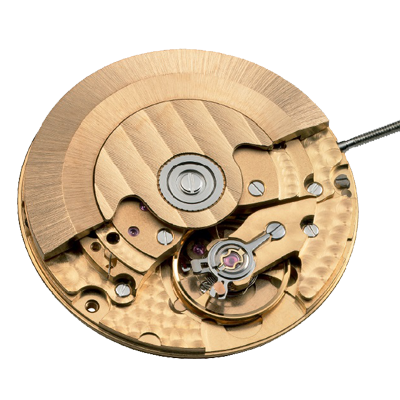 The heart and soul of the Balmer F-type is the Felsa precision self-winding mechanical movement, developed exclusively for Balmer. The Felsa movement is pure Swiss inspiration, designed by the legendary firm of Leschot SA, in Neuchâtel, and meticulously crafted at the company’s state-of-the-art facility in La Chaux-de-Fonds, is a masterpiece of design, the perfect blending of precision engineered components and famed Swiss craftsmanship. The result is a movement so beautiful that Balmer has added a crystal on the case back to showcase the design. 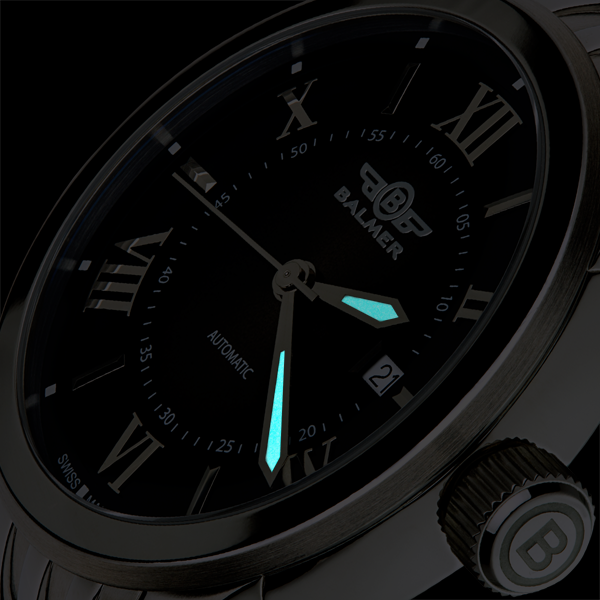 Attention to detail is the hallmark of Balmer watches, that’s why the hands and indexes of the F-Type are illuminated with BGW9 Superluminova for perfect low-light legibility. The generously applied lume provides at-a-glance legibility in a luminescence that both informs and complements the classically designed dial. The Balmer F-type features an eye-catching classically styled two-tone gradient dial that is visual testimony to the elegance of simplicity. 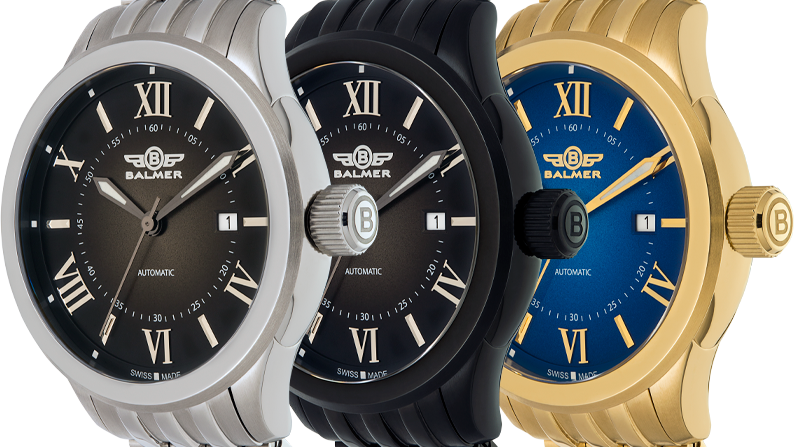 Hand polished Roman numerals offer not only a beautiful complement, but maximum readability, while the scratch resistant sapphire crystal is specially ground for minimal reflections. All-in-all the Balmer F-type is styled not merely for striking good looks, but practical wearability as well. 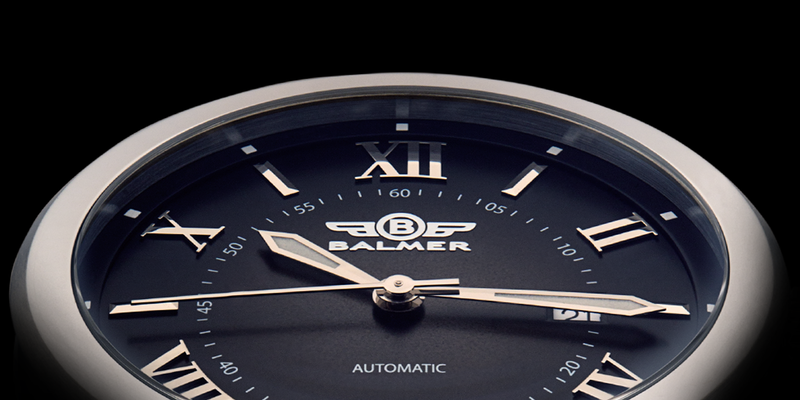 The Balmer F-type represents the epitome of Swiss watch making, with meticulous attention to detail. Beautifully designed, the classically styled case is crafted in surgical-grade stainless steel, resplendent in a lustrous satin finish with carefully hand polished details. Round, polished classic case with brushed bezel. Sapphire crystal caseback. 316L Surgical Stainless Steel Case, Crown and Buckle. Swiss made, self-winding mechanical movement. Big Date, Hour, Minute and Second hands. 7 link Stainless Steel bracelet. 4 links brushed, 3 links polished. Manufacture Leschot SA, La Chaux-de-Fonds. The Felsa movement is pure Swiss inspiration, designed by the legendary firm of Leschot SA, in Neuchâtel, and meticulously crafted at the company’s state-of-the-art facility in La Chaux-de-Fonds. 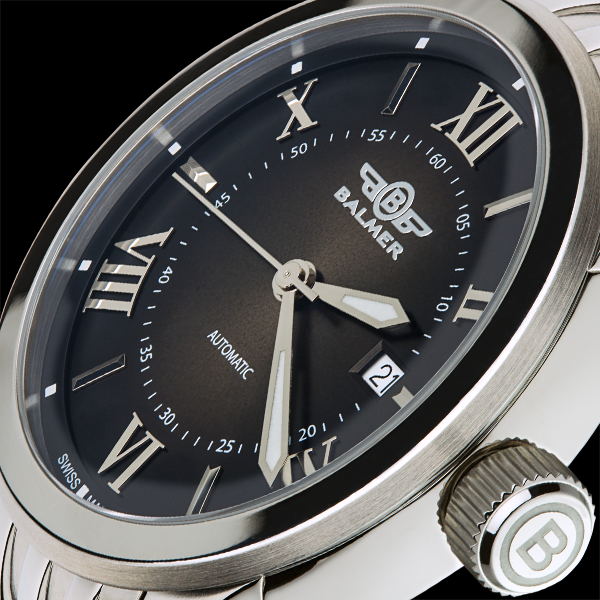 Brushed/Polished Stainless Steel with two tone Black dial. 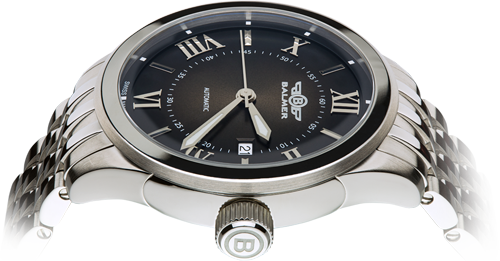 Brushed/Polished Black Ceramic Coating Steel with two tone Black dial. Brushed/Polished Gold IP Coating Steel with two tone Blue dial.